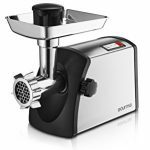 A great meat grinder should have powerful motor, functional gears, essential sausage attachments and come at the right price. We realized that people always set a specific budget when buying a meat grinder. They want a grinder that will suit their needs and offer years of service. 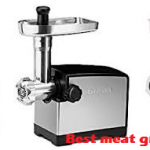 We have reviewed the best meat grinder under 200 to help you make a good choice. 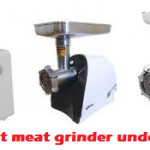 These meat grinders have proved to be the best on the market and deliver quality output in each grinding session. Motor rating – the locked motor wattage might range from 1000 to 3000 watts. A high motor rating will also deliver high power for perfect grinding. Speeds – generally these grinders have three speeds including, low, high and reverse. But you will want to check if the grinder has a circuit breaker for safety during operation. Durability – stainless steel and aluminum constructions are generally durable. Included attachments – some of the components to check include sausage attachments, Kubbe attachments, and stuffing tubes. Also, check if these components are dishwasher safe or hand washable. 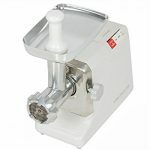 Quality meat grinding and sausage stuffing require a functional meat grinder. 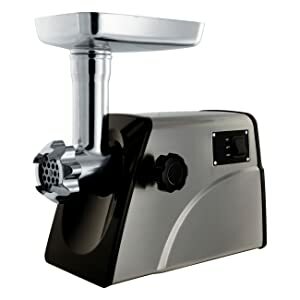 The STX INTERNATIONAL STX-3000-MF Electric Meat Grinder is among the functional grinders that offer quality results each time. This professional grinder comes with 3000W of locked motor wattage to grind both wild and home grown meat. 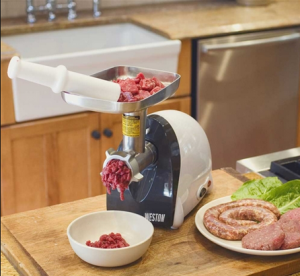 It features 3 speeds allowing for uncompromised meat grinding. Your safety is guaranteed by an integrated circuit breaker. 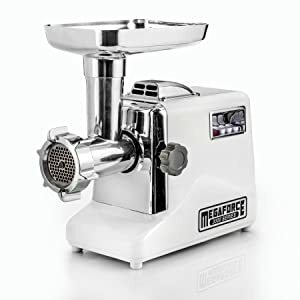 The Megaforce is not like your small grinder, it is a size 12 unit with polished cast aluminum grinding head for longevity. This grinder can handle large pieces of meat thanks to the AVI Technology and 2-1/8 inch hopper. It comes with 3 stainless steel cutting blades for fine, medium and coarse grinding options. These durable cutting blades are hand washable for hygienic grinding. Cleaning the Turboforce attachments is simple through the included guide. This machine offers you the ability to determine what is served for your family. 3 hardened steel grinding plates allow for different levels of grinding. The wagon wheel is specifically meant for coarse grinding. The small plate measures 5/32 inch while the medium plate measures 1.25 inch. 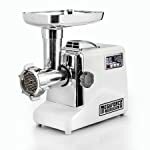 With a permanently lubricated motor, this meat grinder is an indispensable addition to any kitchen. 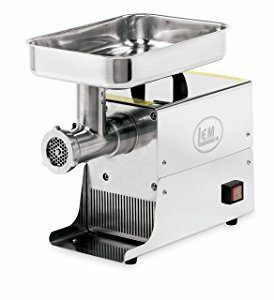 The LEM Products 1158 can be used at home, butcher shop, and even in a grocery. It comes with a 500 watts/1000 watts peak power for unique grinding. This grinder has three speeds, slow, full, plus reverse. You can choose either slow or full speed depending on your grinding needs. The pulse reverse speed helps to maximize the output of the grinding by removing meat debris stuck in the system. The feed tube has an oversized hole allowing for larger pieces to be fed to the auger. So you will grind larger pieces of meat with ease. 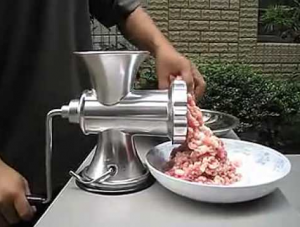 The grinding system doesn’t clog during grinding because it’s constructed to hold larger pieces of meat. Three stainless steel plates including 3/16-inch, 3/8-inch, and stuffing allow for custom results. Also, it features 3 plastic stuffing tubes including 1/2-inch, 1-inch, and 1-3/8-inch. Its large meat pan holds 3 pounds of meat. The LEM Products comes with meat stomper, Goofproof stainless knife and weighs only 16.5 lbs. Its five-foot cord compactly stores under housing. 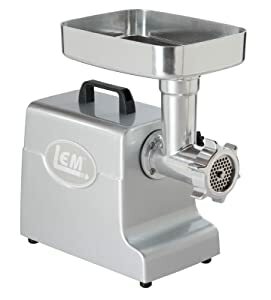 The meat grinder is ETL approved for quality and safe grinding. 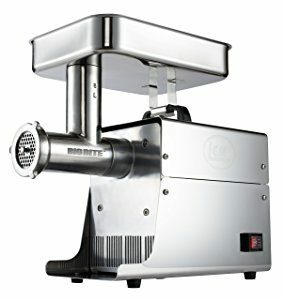 If you want to improve your meat grinding at home, butcher shop or restaurant setting, you should get the right machine. The best meat grinder under 200 might be a good choice in this case. These grinders come with all the features you need for quality grinding. Also, they feature the standard attachments that you need for instant meat grinding without making an additional purchase. You can select one of the grinders recommended in this review to serve your needs. You should check the motor rating, speeds, included attachments and durability before making a final selection. You can scroll back to compare the units again.